Without question, learning how to say hello in Thai is the easiest way to enhance your trip to Thailand. Even if you're only going as far as your neighborhood Thai restaurant for some pad kee mao, a friendly greeting delivered properly will score you some instant culture credit. But of course, learning how to say hello in each country is usually optional. As you travel, you'll be blessed with people who learned some English — a language very different from their own — to accommodate you. Regardless, greeting people in their own language leads to better interactions; doing so shows that you're there for more than just the cheap shopping. Unlike when saying hello in Malaysia or offering greetings in Indonesia, Thai people use the same greeting regardless of the time of day or night. As a traveler, you'll really only need to learn one basic greeting, no matter what time of day or to whom you are speaking. Interestingly, sawasdee was derived from a Sanskrit word by a Thai professor and has only been in widespread use since the 1940s. The Thai language has five tones: mid, low, falling, high, and rising. That's even one more than Mandarin, an arguably difficult language to learn. And unlike when reading Malay and Indonesian, the Thai alphabet won't look familiar at all. In tonal languages such as Thai, Vietnamese, and Mandarin, the meanings of even deceptively short words change based on the tone with which they are pronounced. But there is some good news! No one is going to mind too much if you miss the tones when saying hello in Thailand. Locals will understand your attempts simply based on the context (and your hands being in the wai position). The same applies to when saying "thank you" and other common expressions in Thai. To say hello in Thai politely, you'll need to finish your greeting with one of the finishing participles, either khrap or kha. The tone and enthusiasm of the finishing kha... or khrap! show more energy, emphasis, and to some extent, respect. If you hope to grasp how tones affect meanings in Thai, start by listening closely to how people say kha and khrap. Women sometimes switch to a high tone for kha to impart more enthusiasm. Saying khrap or kha alone is like nodding the head verbally and can mean "yes" or "I understand." After learning how to say hello in Thai, you should know how to offer and return a wai — it's an essential part of Thai etiquette. Thai people don't always shake hands by default. Instead, they offer a friendly wai — a prayer-like gesture with the hands placed together in front of the chest, fingers pointing upward, head slightly bowed forward. The wai is used as part of greetings in Thailand, for goodbyes, to show respect, gratitude, acknowledgement, and during sincere apology. As with bowing in Japan, offering a correct wai follows a protocol based on situation and honorifics. You'll sometimes even see Thai people giving a wai to temples or pictures of the king as they pass. 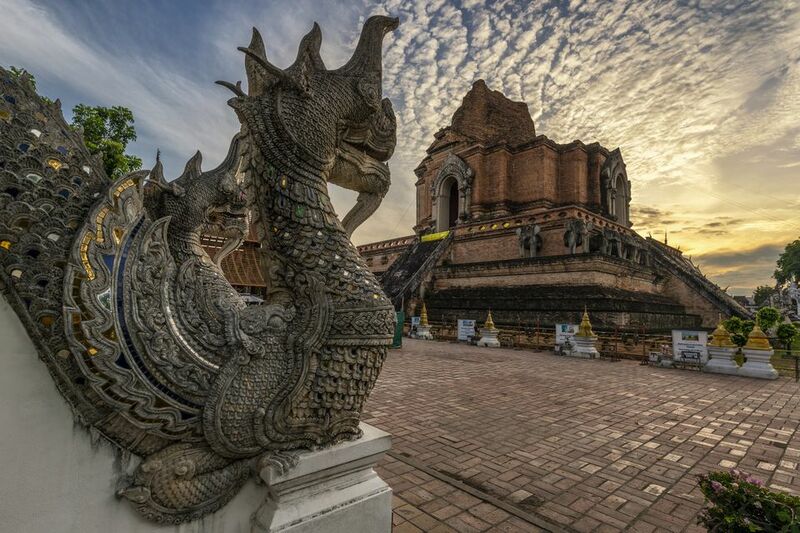 Although an important part of the culture, the wai isn't unique to Thailand. It's seen in other countries throughout Asia. Cambodia has a similar gesture known as the sampeah, and a lower-on-the-body version of the wai is used in India when saying namaste. Not returning someone's wai is rude; only the King of Thailand and monks are not expected to return someone's wai. Unless you're in one of those two categories, giving a wai incorrectly is still better than not making any effort at all. If you're shy or slightly confused about the formalities, even pressing your hands together and raising them in front of your body shows good intentions. Place your hands together centered in front of your chest with fingertips pointing up toward the chin. Bow your head forward until the index fingertips touch the tip of your nose. Don't maintain eye contact; look down. Raise head back up, smile, keeping hands together at chest level to finish the wai. The higher the wai in front of your body, the more respect that is shown. Elders, teachers, public officials, and other important people receive a higher wai. Monks receive the highest wai, and they do not have to return the gesture. To offer an even more respectful wai to monks and important people, do the same as above but hold your hands higher; bow your head until thumbs touch the tip of the nose and fingertips touch the forehead between your eyes. Give monks a higher wai with your hands together and thumbs touching the nose. Try not to give a wai with a cigarette, pen, or other object in your hands; instead, place the object down or dip your head in a light bow to acknowledge someone's wai. In a pinch, you can use your right hand or just dip your head to show acknowledgement. You can sometimes accidentally cause embarrassment by offering a wai to someone of lower social standing; doing so can cause them to lose face. Avoid giving a wai to people younger than yourself and beggars. People providing a service (e.g., servers, drivers, and bellboys) will probably wai you first. The wai can also be casual, particularly in repetitive circumstances. For instance, the staff at 7-Eleven may give a wai to each customer at checkout. You can simply nod or smile to acknowledge. Tip: Don't worry about wai formalities! Thai people wai each other all the time and won't criticize your efforts. If you've got stuff in your hands, making any sort of bowing motion while lifting the hands will suffice for saying, "I acknowledge your wai and would love to return it but my hands are busy." Just remember to smile. Now that you know how to say hello in Thai, you can expand your greeting further by asking how someone is doing. This is optional, of course, but why not show off a little? Try following up your hello with sabai dee mai? (sounds like "sah-bye-dee-mye") — ending with either khrap (male) or kha (female) based on your gender. In essence, you are asking someone, "good, happy, and relaxed, no?" Sabai dee is the default response that you'll hopefully hear most often. There's a reason that you see so many businesses in Thailand with sabai in the name: being sabai sabai is a very good thing! Thailand is nicknamed "Land of the Smiles" — you'll see the famous Thai smile in every type of situation, both good and bad. Variations of the smile are even used as an apology or in not-so-pleasant circumstances as a mechanism to save face or prevent embarrassment. If someone feels embarrassed for you, they may smile. The smile is vital to the concept of saving face, which plays an important role in all daily interactions and transactions throughout Asia. You should smile when negotiating prices, greeting people, buying something, and generally during all interactions. Thriving in the Land of the Smiles includes always keeping your cool no matter the circumstances. Blowing your top because something didn't go as planned will cause other people to be embarrassed for you — that's not a good thing. In Southeast Asia, losing your cool is rarely ever a productive way to solve a problem. Maintaining composure is valued as an important personal trait. For this reason, the authenticity and sincerity of the infamous Thai Smile is sometimes questioned by farang (foreigners) who are visiting Thailand. Yes, someone may easily beam you a genuine, beautiful smile while trying an old scam on you. And you should also return a big smile as you are calling their hand!